Hey everyone! 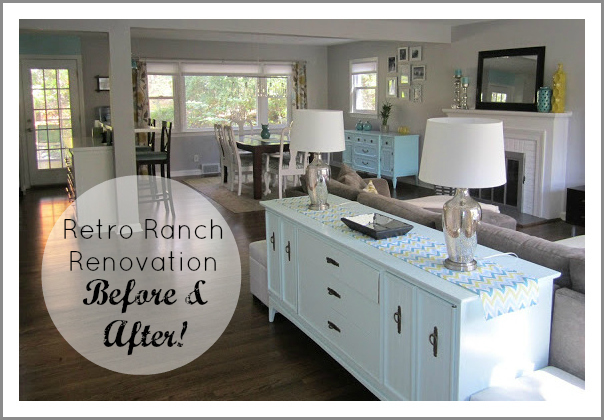 I'm Gabbi from Retro Ranch Renovation...a twenty-something who works with numbers by day, and loves all things design at night...and on the weekends, of course! ;) My hubby and I purchased an extremely outdated, overgrown 1950's ranch in August 2011, and we've been chronicling our adventures to turn it into a place we could call home ever since. I am so excited to be guest posting for Emily today…her blog is one of my favorite reads! During one of her last “link party days” she mentioned that she’d love to share different kinds of projects, crafts and reveals from some of her readers. 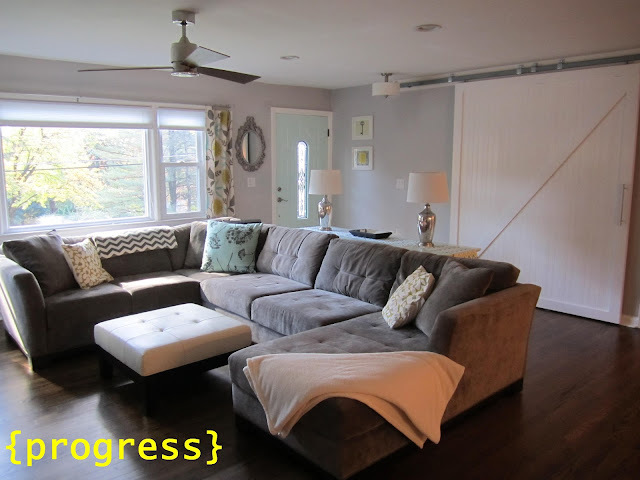 I couldn’t help but immediately think of showing Emily the major change that took place in the living space of our home. While the construction aspect took three months, the design aesthetic has been slowly coming together over the past year. 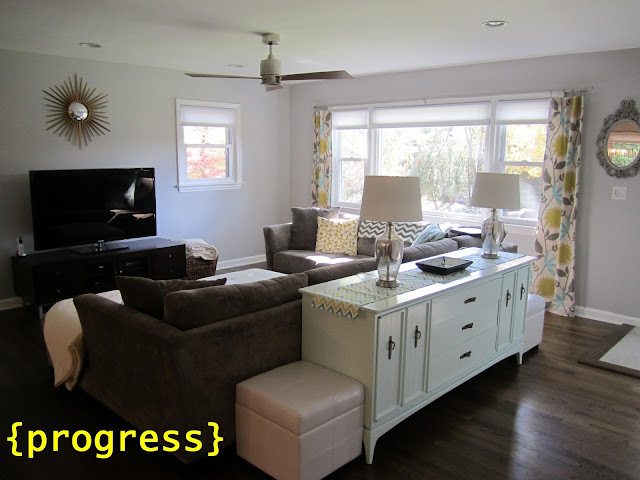 With the help of my family, I’ve had a blast painting Craigslist furniture, transforming our old kitchen cabinetry, stenciling walls, making curtains and doing everything I could to affordably inject our style into our home. And although we continue to tweak the space every day, I think it’s safe to say that my hubby and I are loving the fresh and open home we have created together. Head on over to a previous post of ours to see a whole lot more of the awful befores and updated afters! Thanks so much for having me Emily! I hope you guys enjoyed our transformation! Wow! What a beautiful, bright and airy space! Beautiful spaces, eh?! I'm in love with the colors and patterns Gabbi uses in her home! Absolutely gorgeous - what a transformation!!! What a fantastic transformation! Thanks so much for sharing. 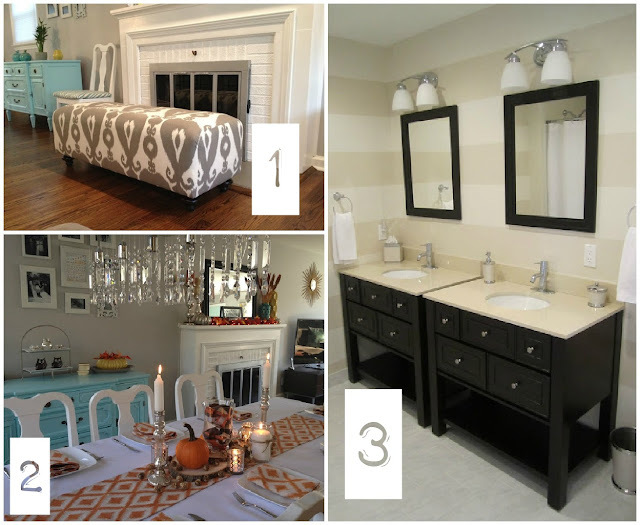 Great guest post, love Gabbi's style! I looooove Gabbi's home! She has such an awesome light and airy style. So fresh and modern and inviting! Love it! RRR is one of our favorite blogs. 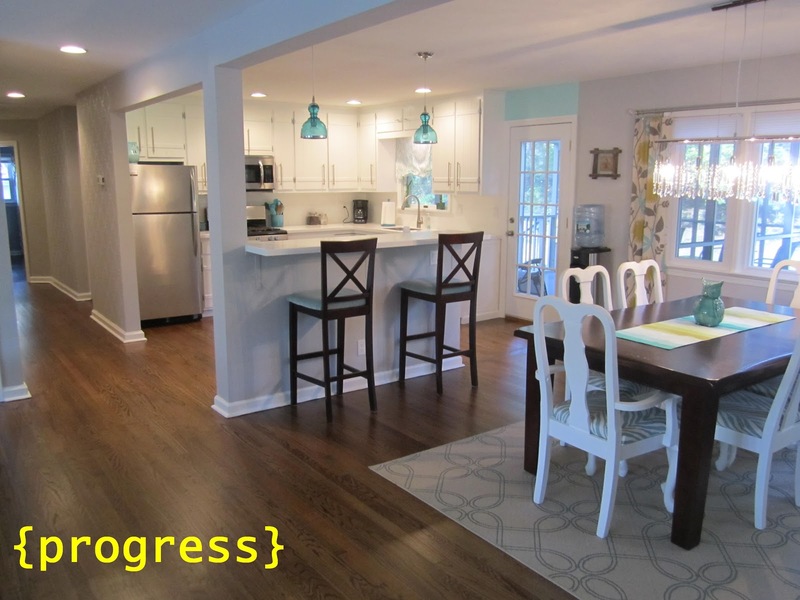 This house transformation is unbelievable and I love their color palatte. 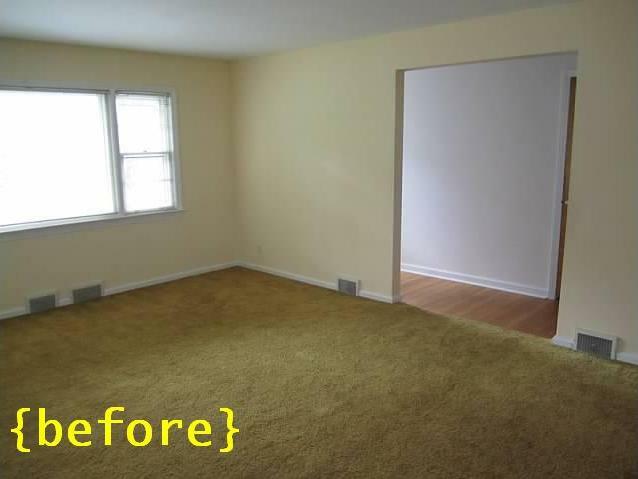 I love the transformations and how they knocked out some walls to really open it up! will def start following their blog now! Love the wood floors and the sliding barn door. Amazing job! 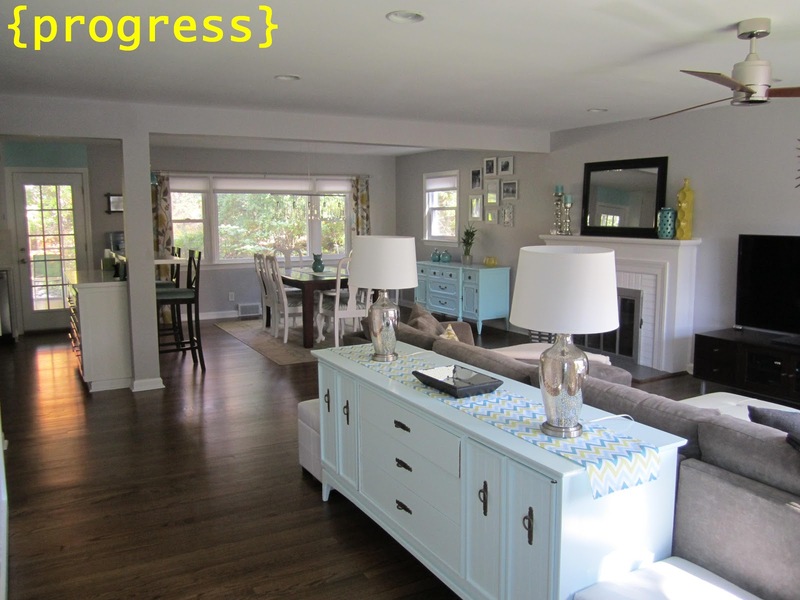 I love the "lightness" ofnthe in progress spaces. Wonderful job! 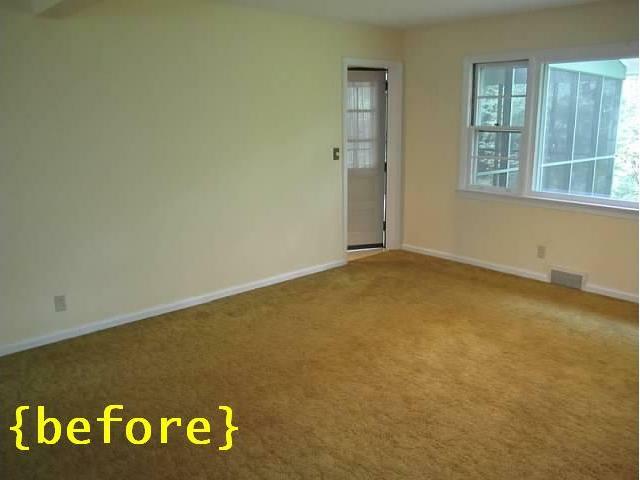 Wonderful transformation...It's not the same house anymore. amazing photos and incredible style. the whole place rocks! Beautiful transformation Gabbi, it's just amazing! You brought so much light into that home. 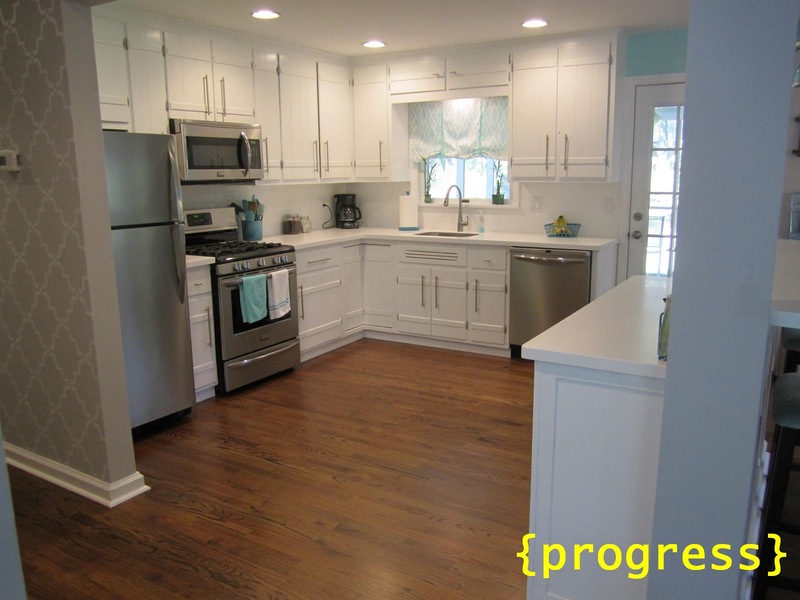 I will be sending this post to my husband to show him how it's possible to transform a house that we may not love into our dream home. Gabbi - great job!! I am planning a few home projects and this is such an inspiration. What a fantastic renovation, I love the small pops of blue and yellow in the living room. And the kitchen looks so much better white, its really fresh and inviting. What an awesome job! It is looking great. P.S. Love that ikat upholstered bench. Tres belle! Gah. I love Gabbi and everything she does! Beautiful. Absolutely gorgeous! This is the idea we had for opening up our kitchen! We didn't know how to explain it, and there it is, YOUR house. Our kitchen, dining room and living room are all laid out the same! 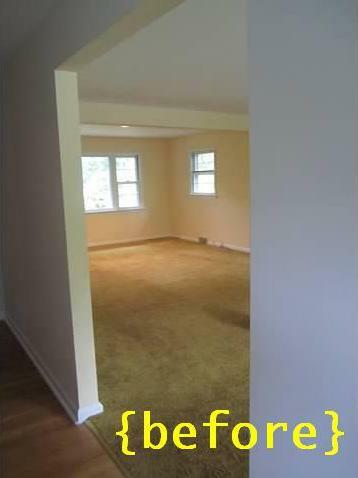 We have the same wood floors, colors, etc. Thanks for posting! Awesome job! I am happy to have found 52 mantels too! you have a super pretty home! loved the tour! 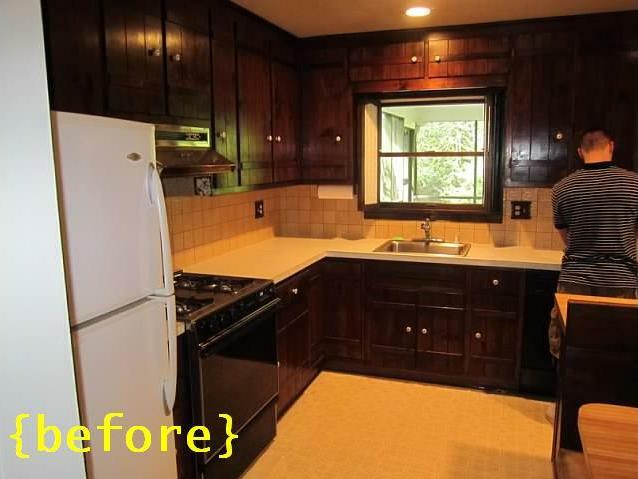 I can't believe the before and after pictures. I love the 2 blue ceiling lamps in the kitchen. Where are these from. I have been looking for new lighting for my kitchen but can't seem to find anything that says 'me'.